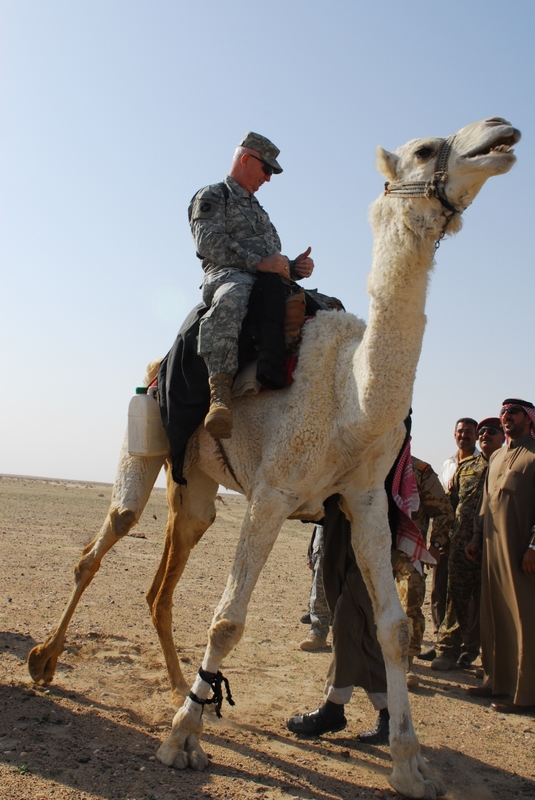 Maj. General Rick Nash tries his hand at camel riding during a visit to the Sa’adoun tribe confederation land. Last month, the zenpundit (Mark Safranski) came up with a startling idea: “The Post-COIN Era is Here.” The idea, while revelatory, is definitely worth consideration. The modern timescale for adopting and conceiving new doctrine has shrunk from the decades it used to take to only a few short years – both a blessing and a curse. On the plus side is the ability to shift rapidly from a failed strategy to one which stands a chance of succeeding, saving time and lives that would otherwise be wasted. At the same time, an untested new idea runs the risk of failing, in perhaps even more spectacular fashion. 1) The ”Big Army, fire the artillery, fly B-52’s and Search & Destroy=counterinsurgency” approach proved to be tactically and strategically bankrupt in Iraq. It failed in Mesopotamia as it failed in the Mekong Delta under Westmoreland – except worse and faster. Period. 2) The loudest other alternative to COIN at the time, the antiwar demand, mostly from Leftwing extremists, of immediately bugging-out of Iraq, damn the consequences, was not politically palatable even for moderately liberal Democrats, to say nothing of Republicans. 3) The 2006 election results were a political earthquake that forced the Bush administration to change policy in Iraq for its’ own sheer political survival. COIN was accepted only because it represented a life preserver for the Bush administration. Safranski also cites the Gentile – Nagl debate (CNAS is all the rage these days) and sees the election of Scott Brown in Massachusetts as another potential game-changer. I have no contention with these points (save the impact Brown might have). I think there’s actually the additional factor of contingency to consider (often overlooked). The more I think about it, the more it seems like COIN was the only logical choice to make when faced with what the situation was. But that doesn’t mean it was the only choice available. It was, however, the only rational choice available. The main problem is that the military leviathan of America cannot adapt or adopt new thinking without a total paradigm shift. That, more than anything, is what makes COIN a passing fad – by its very nature, the Pentagon has to go through phases. Unfortunately, these phases aren’t quick adjustments or refinements. They’re huge, overarching changes that require a full commitment of the DoD. At least, that’s how it works now. It’s also not a process that can be easily halted midstream. The shift in regimental organization to the Pentomic system, considered more appropriate for a nuclear battlefield, was halted only six years after implementation began when it was discovered as too unwieldy. Yet the shortcomings of the system were revealed in a time of relative peace, and the transition that was well underway came to an end as the Pentagon shifted to yet another system, CARS, which in turn was not modified until 1981. Sweeping changes take time. And in the security environment of today, time is a luxury no one can afford. As good as COIN is though, it is not something akin to magic with which to work policy miracles or to substitute for America not having a cohesive and realistic grand strategy. Remaking Afghanistan into France or Japan on the Hindu Kush is beyond the scope of what COIN can accomplish. Or any policy. Or any president. Never mind Obama, Superman, Winston Churchill and Abe Lincoln rolled into one could not make that happen [emphasis in original]. Austerity is the name of the game now, even if the recently-proposed defense budget flies in the face of fiscal reality. The rising deficit combined with a loss of American moral prestige and military overextension will by necessity lead to yet another radical reappraisal of strategy. But the thing is…COIN works in the right context. It’s sometimes extremely effective. But my biggest worry is that if even an honest look at COIN finds something wanting, it won’t portend little changes. But massive ones. And scale is not in our favor.